... and my love for book covers continue. 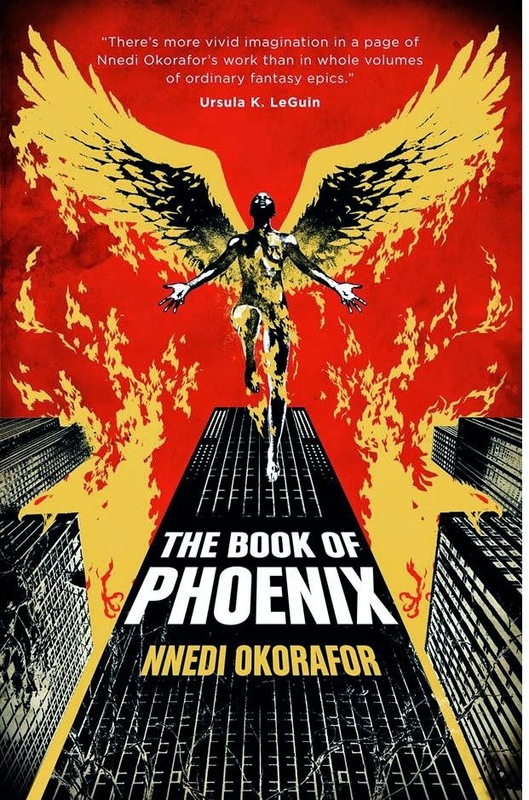 A few hours ago Hodderscape revealed the absolutely hot (no pun intended) cover for the UK edition of Nnedi Okorafor's The Book of Phoenix. Similar to Lagoon, the stunning cover is designed by award-winning South African illustrator and designer Joey Hi-Fi. If ever a cover captured exactly what I felt a book would be about this is it. I love everything about it - Phoenix spreading her wings and rising above what looks like her home in Tower 7. I can feel the heat from her flames and I just have to know more. This judger of book covers is in book cover heaven right now and I can't wait to tuck into the pages of this gorgeously designed book to find out more about Phoenix. The Book of Phoenix is published by Hodder & Stoughton and out May 7th. Can't wait!!!!! Talk about on fire. Sorry US cover, but this right here is the one!!! PS. According to a tweet from Mr. Hi-Fi himself, this is just the first draft. That means it's only going to get even better. Can't wait to see the final cover.